How to foster seamless business steering through harmonisation of operating models, value flows and management reporting. Business transformation, in essence, focuses on fundamentally changing processes, systems, roles and technologies across the entire organisation. Such initiatives are founded on the hopes of achieving measurable improvements in efficiency, effectiveness and stakeholder satisfaction. Naturally, the decision to enact business transformation must be based on a sound understanding of the required changes, how to implement them, and what the implications are once they are implemented. It is imperative to take an embracing approach involving and ensuring alignment between all the stakeholders impacted. Experience shows that this is rarely the case, with disjunct and misaligned efforts from the two worlds of Operations, and Finance & Controlling. Typically, accounting departments are left in the dark about business operations during process design phases of major transformation initiatives, while professionals from purchasing, production planning, and sales & distribution often seem not aware how their business operations impact accounting. The far reaching consequences of misalignment between Operations and Finance & Controlling have been felt at all stages of major business transformation initiatives across many industries. Areas impacted range from process design and systems testing through to hyper-care and running the daily business. To demonstrate this, we present several examples from major business transformation projects, and show how things went wrong. They demonstrate how an apparently isolated problem can have impacts far beyond the radar of those responsible for implementing and championing the change. Because involvement of local tax and finance departments into the project happened too late, the entire procurement process for certain materials had to be redesigned during testing phase. While making up for this, realignment across all related streams resulted in extra effort and the risk of delays in go-live dates. The weighting step that is executed by a subcontractor was part of a recipe. During the process design, the production team only focused on processes relevant for core business. Therefore, the weighting process was not designed and consequently not configured in the ERP system. There was no account assignment. This problem was noticed during hypercare when the process had to be executed. As a result, no sales order could be created. Compounding the problem was the fact that there was no process concept. The whole life cycle of the process had to be adjusted within a productive environment. Assignment of logistic expenses to the right positions are critical from an accounting point of view. These involve cost of distributors. Incorrect valuation of cost of sales, cost of production, and time of sales recognition poses a compliance risk involving tax authorities. This can also have COPA impacts (COGS vs Production Costs), causing dissatisfactions of responsible executives in case of variable salaries. During a business transformation project, there was a lack of knowledge on two sides. Logistics was unaware about the fact that such regulation exists, and accounting unaware about different type of contracts SCM had with its business partners. This problem was noticed during daily business, i.e. after go-live and hypercare. In our Business Flows reference model we demonstrate the real-live integration of business and accounting aspects of enterprise processes. We have compiled relevant content from decades of project experience and modeled these based on established standards. First started as an internal toolbox and training facilitator, our model has reached a maturity we are confident to share externally and that is valued by numerous subscription customers. Based on our industrial reference content and the profound insight of our partner SR Consulting Professionals in financial and management accounting and enterprise architectures, we have developed a concise and pragmatic methodology for representing both value adding activities and their finance & controlling impacts. We are ready to help you implementing your transformation with a methodology that works. Consistently. Value Driven Business Transformation ensures seamless process design and systems implementation through early alignment between operations and Finance & Controlling on key aspects of the business including financial steering, operating models, end to end scenarios and value flows. To accomplish this, we have developed an integrated approach that couples the separated views of operations and accounting. This integrated and aligned business transformation approach allows business steering through harmonization of operating models, value flows and management reporting. Business strategy forms the basis for aligning the operating model with the business & financial steering model. At this early stage, stakeholder from both Operations & Finance & Controlling come together and detail the future enterprise set-up. Based on the defined E2E scenarios and processes, posting rules are derived for the allocation of value flows. Process specifies the interaction of people and systems when executing business operations. 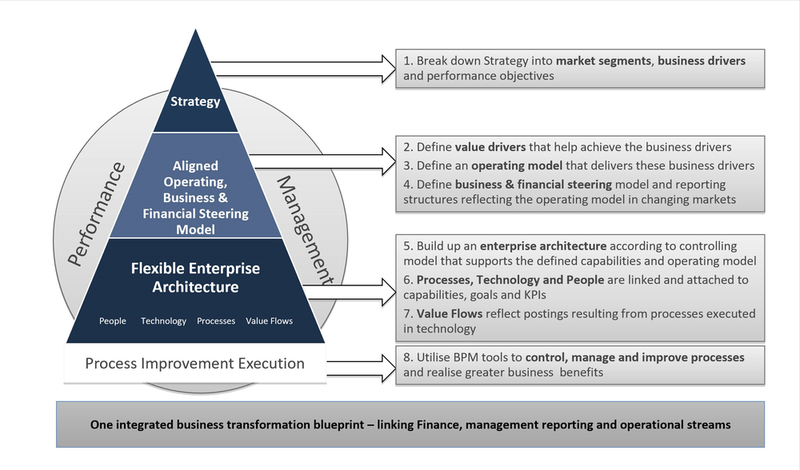 An Integrated business transformation blueprint bridges the gap between finance, management reporting and operational streams during business transformation initiatives. In partnership with SR Consulting Professionals, we have a comprehensive consulting offering including domain expertise, proven consulting approach and dedicated methodology. In addition, our reference content Business Flows provides accelerators which help kick-start your initiative. Get in contact now for a personal presentation on details of our offering. It's about two weeks now since Yaskawa hosted our BPM Day and we discussed the current state and future of Business Process Management - and there was a lot to discuss. How have the drivers of BPM and with them the criteria of success of projects changed over time and what is the outlook for us all as practitioners? Looking back is not actually a core competence of BPM. In contrast, the discipline is characterized by developing processes and organizations from the as-is to the to-be, not much time for looking into the past. However, within this drive towards the future each of us is shaped by their own experience and the wisdom and anecdotes others have shared with us. Likewise, we are and will be influencing co-workers and others. As a sociological model it is justified to assume that every person lives in the context of 7 generations. Primarily of course that of their own peer-group. Then those of their parents and grandparents and usually even that of their great-grandparents. Although the latter influence will already be more indirect and smaller in extent. The same is true for the influence we extend down the generations of our children, grandchildren and great-grandchildren. It's a bit like a bobbin or spool with the individual in the middle and the influencers and those influenced forming the broadening ends to either side. This model can be safely transferred to other contexts to analyse a particular situation and gaze into the future. Although most of the group members had never worked together before, defining how to segregate phases or generations related to our question immediately led to vivid discussions and the biggest challenge soon became retaining the focus on the particular question rather than a discussion of the more global trends. But as they say "Let it flow ..."
What are the influences that make IT projects a success or failure in the eyes of the project team? What are the influences that make IT projects a success or failure in the eyes of the sponsor? "Can't they understand what I need?" How quickly can shifts in requirements be addressed? What are the influences that make IT projects a success or failure in the eyes of the user? I am sure these points will sound familiar to most of you. And there was one over-arching point that came up as a conclusion during the joint discussion. The one factor that is most important is the functional communication between all three groups. And this is where I advocate that change management must be more than the buffer position in your budget plan and more than a stack of ppt slides. Managing change requires skills to actually engage people and make them participate rather than endure. To strengthen our capabilities to address this need bpExperts has started training our own team and partners with the management consulting team of HILL International to provide people-centric change management that actually meets its objective to develop, stabilize and optimize organizations within a smooth transition. Agile BPM – What’s that? Spontaneously, it seems like coming out of a marketing book for beginners: Combine a couple of buzz words and you create a new hype. Or is there more behind it, which really offers a way out of a common dilemma most of us are likely to know? In order to prosper businesses have to keep control over their processes thus ensuring consistency and repeatability as corner stones for operational excellence and customer satisfaction. At the same time, even industries famous for their stability and predictability, feel the pressure to adjust business processes to constantly changing market conditions, customer demands, and supply chain and service networks. On September 10th 2015 it´s time again for our annual BPM day. As usual, the focus will be on costumer use cases, this year under the motto "How BPM can affect the company's success ". It is our pleasure to offer you the opportunity to share experiences within a practice-oriented workshop based on selected presentations. The BPM Day will take place on September 10th in Frankfurt. Please save the date now. Details on the agenda and about the event will follow soon. The event will be moderated in German, presentations will be held in German or English. Participation is free. You can already sign up, as the number of participants is limited. The buzz of agile software implementation, most prominently represented by the Scrum methodology, has hit the doors of the board rooms. It is time to look at it from the business perspective. Go on a roller coaster ride with me!